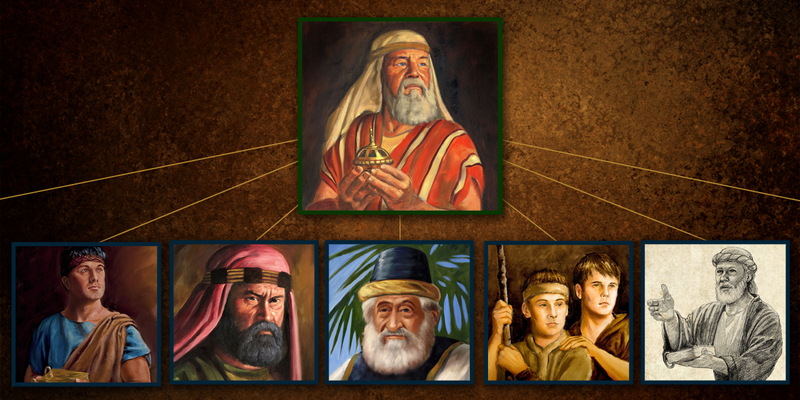 Why Did Lehi Divide His People into Seven Tribes? This system of tribal organization likely stemmed from Lehi’s final patriarchal blessings, where he specifically blessed and counseled the patriarchs or posterities of each of the seven tribes (see 2 Nephi 2–4). In several ways, Lehi’s tribe-defining blessings can be meaningfully compared to the patriarchal blessings given by Abraham, Isaac, and Jacob. Lehi’s posterity repeatedly spoke of him as “our father Lehi” in the same way that Israelites refer to Abraham as “our Father Abraham.” Lehi placed Nephi as a leader over Laman and Lemuel, just as Isaac bypassed Esau and gave the birthright blessing to his younger son Jacob. And like Jacob’s final blessing upon his twelve tribes, Lehi divided his family into groups and blessed them with a land of inheritance. These patriarchal blessings held lasting “religious, military, political, and legal” importance for both posterities. It’s possible that the twelve tribes of Israel and the seven tribes of Lehi were intentionally counted in such a way as to render their final totals as sacred numbers. In ancient Israelite thought, the number twelve was symbolically linked to government and judgment, whereas seven symbolized perfection or completeness. Especially in the book of Leviticus, the number seven appears some 46 times, in priestly temple contexts. Jacob’s twelve tribes were increased to thirteen when Joseph’s inheritance and blessing was divided between his two sons, Ephraim and Manasseh. Yet because the priestly tribe of Levi did not inherit a portion of the promised land, they were not counted as one of Israel’s tribes, and thus the total number of tribes was reduced back to twelve (see Numbers 1:47–50). Corbin Volluz has argued, “It appears the Old Testament modifies the figure of thirteen tribes to twelve in order to maintain this important number, and the Book of Mormon similarly modifies the figure of eight tribes to seven, omitting the tribe of Sam, which the Book of Mormon goes out of its way to draw special attention to by pointing out that Sam’s seed is being numbered with Nephi’s” (see 2 Nephi 4:11). Like the Israelites who saw the land of Israel as a holy land of promise, Lehi also saw his land of inheritance in the New World as holy land of covenant, making his division of his posterity into seven tribes understandably appropriate within a sacred temple context. The symbolic and sacred significance of the seven tribes may have been an important factor in their preservation and continuity throughout so many years. It is also notable that the number seven held cosmic significance among ancient peoples in Mesoamerica. Michael Coe described seven as the “mystic number of the earth’s surface,” and according to Diane Wirth, “it represented the seven directions in the universe—four cardinal directions plus the zenith or sky, center, and nadir or underworld.” Moreover, Mesoamerican legends and artwork distinctly and repeatedly depict their various peoples as coming forth from seven caves or lineages. Although no direct evidence for a relationship currently exists, it’s possible that these ancient legends may in some way correspond to the seven founding tribes mentioned in the Book of Mormon. Aside from supporting the Book of Mormon as a consistent and authentically ancient text, Lehi’s seven tribes have immediate relevance for modern readers. In 1829, the Lord Himself identified these exact same tribes, declaring that the “knowledge of a Savior” would come to the “Nephites, and the Jacobites, and the Josephites, and the Zoramites, through the testimony of their fathers—And this testimony shall come to the knowledge of the Lamanites, and the Lemuelites, and the Ishmaelites, who dwindled in unbelief” (Doctrine and Covenants 3:16–18). Ross Christensen explained, “We don’t know exactly where the seven lineages are now any more than we know where the lost tribes of Israel are located. But the seven lineages do exist somewhere because the Lord promised in 1828 to bring them to a knowledge of the Savior.” Although Lehi’s seven lineages are not declared in blessings given by stake patriarchs in the LDS church, they clearly are analogous to the lasting legacy and importance of the twelve tribes of Israel. In some way or another, it seems that these seven tribes will provide an enduring basis for personal relationships and familial connections for the descendants of Lehi. Corbin Volluz, “A Study in Seven: Hebrew Numerology in the Book of Mormon,” BYU Studies Quarterly 53, no. 2 (2014): 57–83. Diane E. Wirth, “Revisiting the Seven Lineages of the Book of Mormon and the Seven Tribes of Mesoamerica,” BYU Studies Quarterly 52, no. 4 (2013): 77–88. John L. Sorenson, John A. Tvedtnes, and John W. Welch, “Seven Tribes: An Aspect of Lehi’s Legacy,” in Reexploring the Book of Mormon: A Decade of New Research, ed. John W. Welch (Salt Lake City and Provo, UT: Deseret Book and FARMS, 1992), 93–95. John W. Welch, “Lehi’s Last Will and Testament: A Legal Approach,” in Second Nephi, The Doctrinal Structure, Book of Mormon Symposium Series, Volume 3, ed. Monte S. Nyman and Charles D. Tate Jr. (Provo, UT: Religious Studies Center, Brigham Young University, 1989), esp. 68–70, building on Sorenson, Tvedtnes, and Welch, “Seven Tribes,” 93–95. See John W. Welch and J. Gregory Welch, Charting the Book of Mormon: Visual Aids for Personal Study and Teaching (Provo, UT: FARMS, 1999), chart 116. John L. Sorenson, John A. Tvedtnes, and John W. Welch, “Seven Tribes: An Aspect of Lehi’s Legacy,” in Reexploring the Book of Mormon: A Decade of New Research, ed. John W. Welch (Provo, UT: FARMS, 1992), 93. See Sorenson, Tvedtnes, and Welch, “Seven Tribes,” 93. See John W. Welch, “Lehi’s Last Will and Testament: A Legal Approach,” in Second Nephi, The Doctrinal Structure, Book of Mormon Symposium Series, Volume 3, ed. Monte S. Nyman and Charles D. Tate Jr. (Provo, UT: Religious Studies Center, Brigham Young University, 1989), 69, 73–74; Sidney B. Sperry, “Types of Literature in the Book of Mormon: Patriarchal Blessings, Symbolic Prophecy, Prophetic Narrative, Prophetic Dialogue,” Journal of Book of Mormon Studies 4, no. 1 (1995): 95–98; Book of Mormon Central, “Should 2 Nephi 1:1–4:12 Be Called the ‘Testament of Lehi’? (2 Nephi 3:3),” KnoWhy 29 (February 9, 2016). See Sorenson, Tvedtnes, and Welch, “Seven Tribes,” 94. For the ancient legal implications of Lehi’s blessings upon Nephi, see Welch, “Lehi’s Last Will and Testament,” 74–79. See also, John A. Tvedtnes, “Notes and Communications: ‘My First-Born in the Wilderness,’” Journal of Book of Mormon Studies 3, no. 1 (1994): 207–209. See Welch, “Lehi’s Last Will and Testament,” 68–71. See Sorenson, Tvedtnes, and Welch, “Seven Tribes,” 94–95. See John W. Welch, “Number 24,” in Reexploring the Book of Mormon, 272–274. Corbin Volluz, “A Study in Seven: Hebrew Numerology in the Book of Mormon,” BYU Studies Quarterly 53, no. 2 (2014): 60–64. See Genesis 48 and Joshua 17:14–17. Michael D. Coe, The Maya, 6th ed. (New York, NY: Thames and Hudson, 1999), 157. Diane E. Wirth, “Revisiting the Seven Lineages of the Book of Mormon and the Seven Tribes of Mesoamerica,” BYU Studies Quarterly 52, no. 4 (2013): 77. See Wirth, “Revising the Seven Lineages,” 79–83. Hugh Nibley, Teachings of the Book of Mormon, 4 vols. (Provo, UT: FARMS, 1993), 4:25. Hugh Nibley, An Approach to the Book of Mormon, 2nd ed. (Salt Lake City, UT: Deseret Book, 1976), 386 n. 7. Ross T. Christenen, “The Seven Lineages of Lehi,” New Era, May 1975, online at lds.org. For the profound spiritual meaning and importance of such blessings, see Thomas S. Monson, “Your Patriarchal Blessing: A Liahona of Light,” Ensign, November 1986, online at lds.org. The Nephite kingdom was a federation, dividing political power between the tribes and the central government as a balance of powers.